In the quiet expanse of the Congolese wilderness, a solitary young man works to fell a giant tree using only an axe. The only sound is that of his rhythmic blows and the surrounding birdsong. The camera stays close, circling the determined figure until, finally, the tree falls. This, we learn, is charcoal farmer Kabwita Kasongo, who engages in this backbreaking work to make bags of the fuel, which he straps to a groaning bicycle and pushes for 30 miles to sell in the nearest town. The camera follows him step by agonising step as he makes his often dangerous journey, hawks his charcoal to hagglers who push down the price of each precious sack, and engages in some energetic worship at a town-hall church before turning for home. Documentaries about lives far removed from our own are now so ubiquitous that complacency can sometimes creep in. Not so with Emmanuel Gras's incredible film, which is something altogether different in approach and tone. Constructed much like a fiction narrative – and, indeed, Makala would make a powerful double-bill with Alain Gomis's Congo-set Félicité – there are no talking heads, on-screen text (save for the subtitles) or other contextual information; we are thrown into Kabwita's life, and follow him as he lives it. This simple method belies the film's powerful impact, brought about through intimate camerawork, sensitive editing from Karen Benainous and a hauntingly beautiful score by Gaspar Claus. Together, they create a viewing experience that is not so much the study of a man but a sensory immersion; a journey of sweat and blood and steadfast resolution that is keenly, painfully felt. Makala feels cinematic in both its visuals (dust from a passing car billows around Kabwita, firelight casts evening trees in dramatic silhouette) and its story (an atmosphere of myth and fable shrouds this individual odyssey). Yet, by the film's end, as Kabwita toils in order to build a new home for his wife and children, we are reminded that the greatest endeavours come from the most recognisably human of instincts: love, survival and hope. 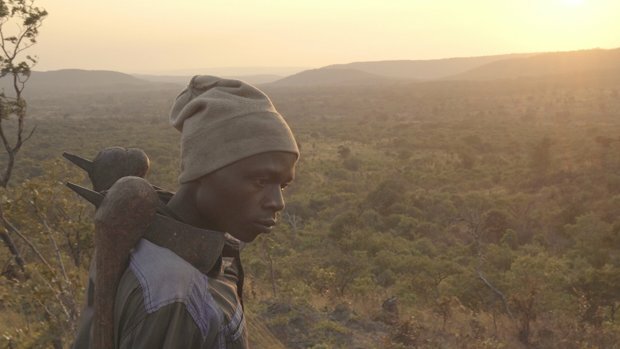 Immersive documentary about a Congolese charcoal maker, Kabwita Kasongo, which follows him as he cuts down trees, makes them into a charcoal and carts bags 30 miles to the nearest town to sell. A journey of sweat and blood and steadfast resolution, highly cinematic and powerful.